Fastener Kit, with fasteners. Price/Kit. 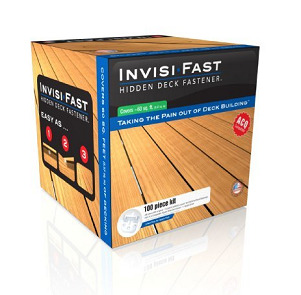 The Invisi-Fast Fasteners are made of tough, UV resistant Lexan to ensure durability. The 500 piece kit comes with 440 pieces with a 1/4" spacer and 60 without a spacer for perimeter fastening and 1500 1-1/8" ACQ compatible screws. creating a clean look from above.